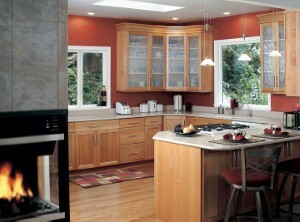 It's that time of year when you're probably looking to do some quick kitchen makeovers to reflect the seasonal changes. As we leave autumn behind, you'll want to move from those traditional reds, yellows and golds into a slightly more festive look. But the greens and reds of Christmas can't last forever. Instead, consider a few of these winter-inspired hues, whether for your dish towels, custom cabinets or table runners. This one's a no-brainer. Winter is all about the stark beauty of snow. But it's also about contrasting that beauty with other hues. While a snow-covered field is a sublime sight, so is a majestic pine tree dressed in white. This colorful contrast is iconic of winter. The same goes for these two colors, which make for excellent and warming glows. Rather than bright Christmas reds, think of a fireplace's glow and the accent this lends a room. You'll need more earth tones to add, and a great way to get them is to mix some of the other hues together. Find creams, gray-browns and slate hues to give your wintertime color scheme an earthy coziness.